Chioggia, sometimes called Little Venice, is a fishing port on the Venetian lagoon. At the heart of the historic center is a wide pedestrian street lined with shops and bars that are the scene of a lively evening passeggiata and the Sottomarina area, 2 km from the port, has good sandy beaches. 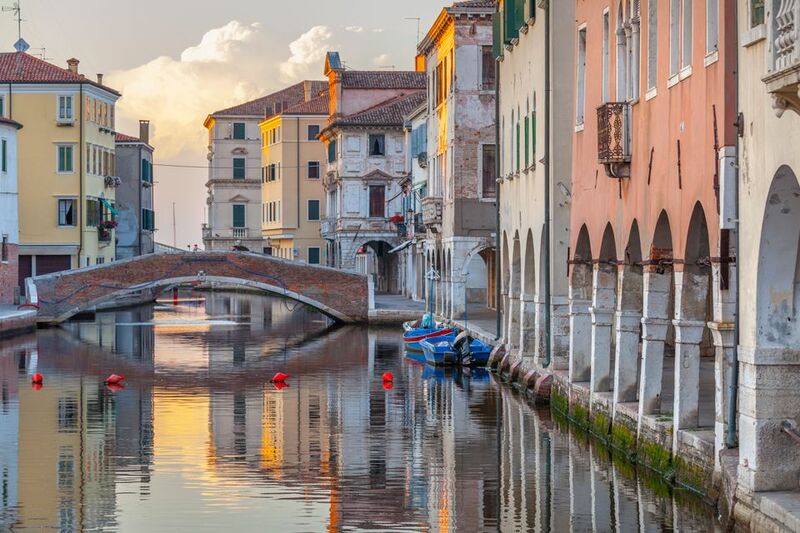 Chioggia can be visited as a day trip from Venice and in summer, when there's direct ferry service, it makes a good base for exploring Venice as its hotels, restaurants, and bars are generally less costly than those in Venice. Chioggia is on a small island in the southern part of the Lagoon of Venice. It's in the Veneto region on Italy's east coast, about 25 km south of Venice (50 km by road). The Grande Hotel Italia is in an ideal location right by the port and Piazzetta Vigo. Caldin's Hotel is a 1-star hotel in the historic center. Most hotels are found in the Sottomarina beach area. There's a summer tourist boat that runs between Chioggia and Saint Mark's Square in Venice, from early June until late September. The rest of the year, it's possible to make the trip by taking a vaporetto to Pellestrina, then transferring to a bus, and finally catching the number 1 vaporetto at Lido to get to St. Mark's Square. Other options are a bus from Chioggia to Piazzale Roma in Venice or the train, changing in Rovigo and taking over two hours. Chioggia is on a small rail line that runs from Rovigo, between Padova and Ferrara. The train station is a little out of town. During summer, there are several buses a day from Venice's airport to the Sottomarina beach hotels. Buses run to Chioggia from Padua and Venice. Corso del Popolo, the wide main street through the heart of the historic center, is a good place for strolling, shopping, or enjoying a drink at an outdoor table (where there's not a big price increase for sitting outside). Piazzetta Vigo and Bridge Piazzetta Vigo are at the end of Corso del Popolo by the port. Here you'll find a bar, ice cream, hotel, souvenir shops, and sometimes entertainment. From the square, a picturesque white marble bridge crosses the Vena Canal to the Church of San Domenico. Just around the corner to the left of the piazza is the port where the vaporetto (boat bus) and tourist boat docks. Clock Tower and Clock Museum, on Corso del Popolo, can be visited on Sundays and holidays. The Duomo, or cathedral, is at the opposite end of Corso del Popolo from the port. It became a cathedral in 1110 but was rebuilt in 1623. The cathedral has a marble pulpit with gold canopy and a decorated 17th-century altar. There's a nice 19th century stained glass window. Next to the Duomo is a 14th-century bell tower. The Sacred Art Museum is near the Duomo. It contains items from the churches and religious paintings but has limited hours. The Museum of the South Lagoon is in a building that was once a monastery. It houses artifacts and pictures relating to the south lagoon including models of boats, agricultural equipment, and some paintings. There's an old stone town gate near the museum.